Although it was a cold month, it certainly wasn’t as cold as the February that just passed or March of last year. Compared to last year’s March, which was 5.6 degrees colder than average, this March was “only” 1.3 degrees colder. 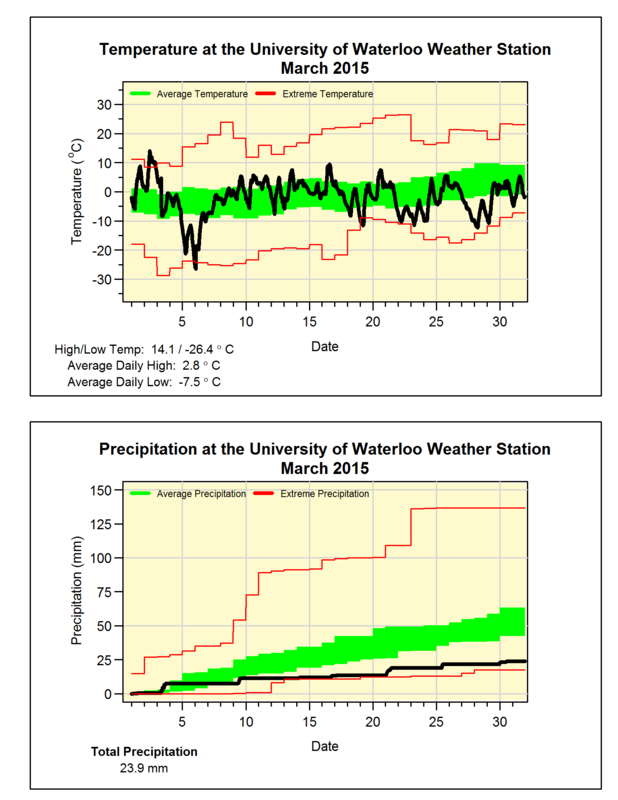 There were only a few days with a small amount of precipitation, staying below average for the entire month. The total of 23.9 mm much less than the average of 61.0 mm. With another dry month, the total for the year of 121.7 mm is well below the 187.6 mm that we would expect at this point in the year. We only had 6.5 cm of snow during March, about a quarter of the average of 26.5 cm. Of course we usually see some snow after March, so I’m not calling an end to the snowfall season, but we currently stand at 124.5 cm of snow since the fall compared to the average of 159.7 cm.